West’s Double Standards: An Unending threat for the World? When the Syrian regime was accused of using chemical weapons in Syria in April this year, US President Trump immediately issued a tweet describing the Syrian President Basharul Asad as “an animal” who gassed his own people. And when anti-government demonstrations erupted in several Iranian cities earlier this year, the US ambassador to UN Nikki Haley was quick to embrace their cause. “The Iranian regime’s contempt for the rights of its people has been widely documented for many years,” she told the UN Security Council session. However, the US, conversely, has been keeping mum over human rights violations perpetrated by its allies; Saudi Arabia, Israel and Egypt. The US, instead, supported them with money, weapons and deals despite their anti-democracy agendas and ruthless suppression of political opponents. The United States even continues to assist Saudi Arabia in its atrocity-ridden military intervention in Yemen. As Israel’s biggest ally, the US has used its UN Security Council veto dozens of times to protect the Jewish state from resolutions condemning illegal settlements to violence against Palestinians. Most of the big powers take pains to portray themselves as humane, lovers and protectors of rights and democracy, yet the reality is quite different. They often indulge themselves in double standards and selective morality, unmatched with their known commitments to justice and liberties. 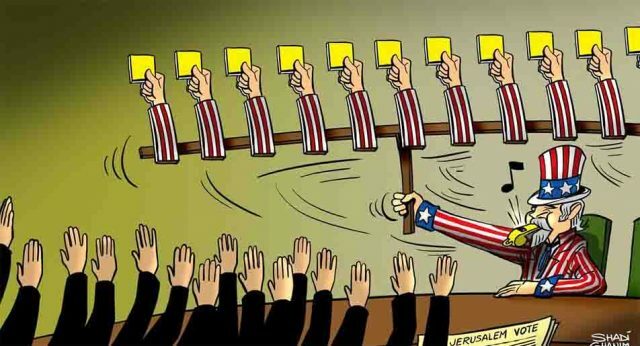 The United States, particularly, has been supporting extremely repressive regimes like the Shah of Iran, Nicaragua’s Somoza family, Taiwan’s Chiang Kai-shek, and Egypt’s Hosni Mubarak and military dictators like Egypt’s Abdul Fatah Alsisi and Pakistan’s Zia-ul-haq. The discriminatory US policy on intended Indian and Pakistani membership in the Nuclear Suppliers Group (NSG) is another classic case of double standard. Pakistan and India applied for NSG membership in 2016. Though the signing of Nuclear Non-Proliferation Treaty (NPT) is a prerequisite for entry and India is yet to sign it, the US is spearheading efforts to waiver the NPT- signing exemption for India. And the United States has added seven Pakistani companies to a list of foreign entities that are subject to stringent export control measures, a move that could hamper Pakistan’s bid to join NSG. The US has also signed nuclear deal with India but Pakistan has been denied the same deal. The pact between the US and India exempts military facilities and stockpiles of nuclear fuel from scrutiny by the International Atomic Energy agency which has enabled India to sign nuclear cooperation agreements with Japan, Russia, France, Britain, South Korea, Canada, Argentina, Kazakhstan, Mongolia, and Namibia. India rejects this line, insisting Kashmir is a bilateral dispute between the two countries. The constitution of the UN Security Council is anything but justice. There is no equality of opportunity to every member state. Veto power given to big powers, therein gives undue leverage to them in getting things done as against the smaller ones. Which means that if any P-5 member or its ally is the aggressor or wrongdoer, no adverse action is possible against it as the P-5 member vetoes any such move. As Israel’s biggest ally, the US has used its UN Security Council veto dozens of times to protect the Jewish state from resolutions condemning illegal settlements to violence against Palestinians. While Israel is allowed to stockpile loads of nuclear arms and no hostile military action is initiated against it even if it blatantly and arrogantly rejects UN resolutions on halt of extension in settlements, Iraq is attacked and its cities turned into heaps of debris under the false pretext that it’s preparing/piling weapons of mass destruction despite report to the contrary by UN inspectors who had been deputed there. And while there is continuous silence on blatant heinous human violations by “allies” such as Israel, there is a strong reaction to similar incidents perpetrated by “others” such as Saddam Hussain’s era Iraq. And it is nothing but double standard and selective morality if Israel that openly violates/rejects international laws, UN resolutions and any serious effort for peaceful solution of its issues with Palestinians is equated with/ preferred over Palestinians whose lands have been usurped and who are being displaced and denied human rights. Veto power given to big powers, therein gives undue leverage to them in getting things done as against the smaller ones. Catalonia’s recent example, where Spain arrested an elected leader Carles Puidgemont for holding a separatist referendum, is ironic how the western world, across Europe, has united to extradite an elected Spanish leader, with popular mandate, yet is often seen providing asylums (and perhaps other help) to violent insurgent leaders from Baloch insurgency in Pakistan. Read more: Wrath for separatists in Spain but sympathy for Baloch insurgents from Pakistan: Europe’s Double Standards? Another example is their take on Pak- India relations. With both being nuclear powers, a war between the two can have dangerous repercussions for global peace. But the US and Britain famously urge Pakistan and India to resolve their issues through mutual negotiations. As India is not ready to talk to Pakistan, accusing Pakistan of state terrorism, Pakistan rightly urges major powers for mediation on Kashmir. India rejects this line, insisting Kashmir is a bilateral dispute between the two countries. When the US and Britain insist India and Pakistan should resolve their dispute through mutual dialogue and refuse to mediate or condemn India for its atrocities in Kashmir, they are actually toeing Indian lines. It is but injustice if India which is clearly the wrongdoer being violator of several UN resolutions on Kashmir and whose leaders openly admit helping breaking up Pakistan in 1971 and vowing to drying up Pakistan against all international norms – is treated at par with Pakistan -which is trying its level best to bring India to the negotiation table for resolution of its disputes with it though unsuccessfully so far. One fails to understand how can Pakistan and India resolve their disputes peacefully and through mutual discussions when India is not ready to talk to Pakistan and powerful nations are silent spectators lest any offer for mediation or any criticism of perpetrated state-violence by India in Kashmir displease India – a big economic market. The US and Britain say they are perturbed over violence in Kashmir and urge patience. It is welcome but what is objectionable is when the oppressor is not asked to refrain from using brute force against the peaceful demonstrators and the unarmed oppressed Kashmiri civilians are not openly supported in their fight for self-determination allowed and promised to them by UN resolutions in 1948, 1949 and by the Indian leadership till 1957 before Kashmir was made an integral part of Indian federation. Another example of this double standard is the stereotype mindset that eyes all Muslim nation/states as extremists. Never has any extremist political or religious group obtained absolute majority in any Muslim country in any general elections. Such groups either don’t have the courage to take part and if they do, they have the lowest popular support base, often standing at less than one percent. Iraq is attacked and its cities turned into heaps of debris under the false pretext that it’s preparing/piling weapons of mass destruction despite report to the contrary by UN inspectors who had been deputed there. While Pakistan is considered an intolerant and extremist society, no extremist group ever has obtained absolute majority here. For example, the Jamat-e-Islami Pakistan, an Islamic fundamentalist party, obtained only 0.4 percent of the total polled 46 million votes in the 2013 elections while Pakistan Muslim League-N, Pakistan People’s Party and Pakistan Tehreek Insaf having tolerant, democratic and anti-extremism credentials jointly polled around 30 million of the total votes. But India is considered one of the biggest democratic and liberal society in the world despite the fact that Prime Minister Narendara Modi’s Bharatia Janata Party, an extremist Hindu fundamentalist party, is voted to power with a clear majority in the 2014 Indian General Elections –it contested on 437 seats of the total 543 seats in the LoK Sabha and grabbed 282 seats, polling over 31 percent of the total polled votes. The US and other states may have plausible arguments and reasons for persisting in such double standards. But they need to be candid and acknowledge that their decisions are based on cold calculations of national interest, not ethical considerations. They should at least spare us the pretense that they care about human rights and liberties. I am an academic, columnist, and a social worker. الوداع ونگ کمانڈر ابھے نیندن!